This excavation was carried out in December 2004 by Y.G. Contract Archaeology company executive and head archaeologist Yehuda Govrin. The site is located in the southern Negev, and was under a planning application by Rotem Emprat Negev Corporation Ltd. 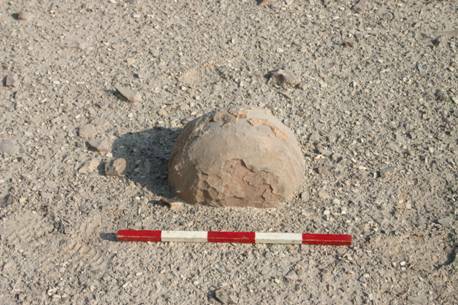 The latter commissioned an archaeological survey of the area, which was conducted by Israel Antiquities Authority (IAA) archaeologist Yeshayahu Lender. In the subsequent excavation of sites located during that survey, Y.G. Contract Archaeology worked closely with the IAA. 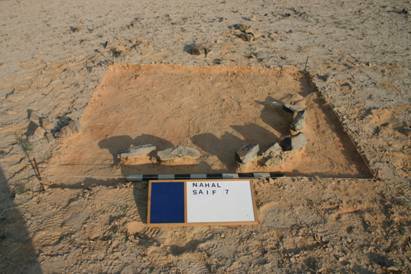 In fact, built heritage and archaeological remains in this area of Nahal Sayif proved to be thin on the ground. As is often the case with prehistoric archaeology, m any of the features initially thought to be anthropogenic were shown by excavation to be natural formations (Sites 3, 4, 8, 12, 13). However, one stone circle (Site 7) and one possible symbolic feature (Site 8 ‘stela’) were found.